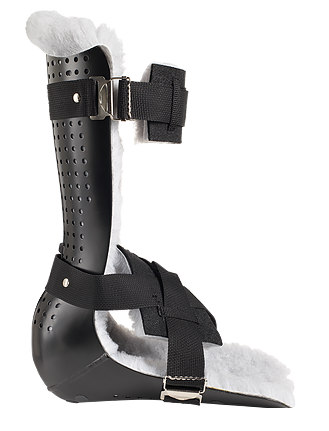 PFS Med provides the option to convert your foot splint into a long leg splint. The PFS Med Posterior Knee Orthosis (PKO) easily attaches to any adult-size TAFO making it a Knee Tibial Ankle Foot Orthosis (KTAFO or KAFO) for positioning at 0° knee flexion. Strategically placed straps provide counterforce while relieving circumferential pressure. The PKO allows easy access for dressing changes, wound care, arterial monitoring, and therapeutic range of motion exercises. Improved design to obtain full knee extension. TAFO sizing is critical to knee placement.